Stuart Messenger Crowned Employee of the Year as judges praise Stud and Stable Staff. 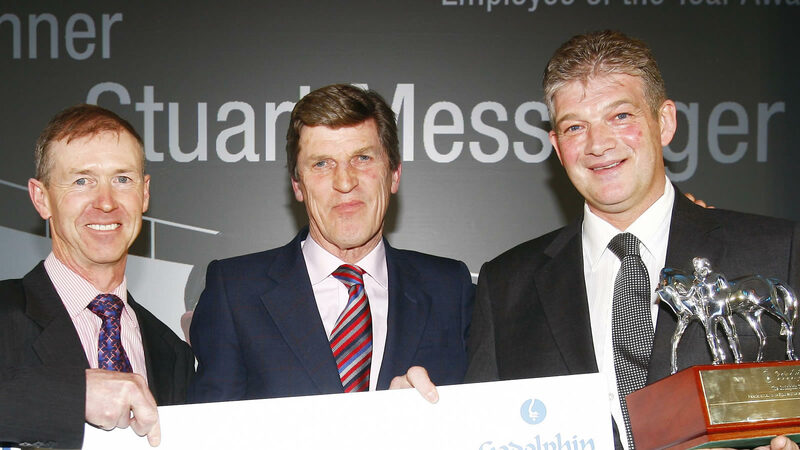 Stuart Messenger, Head Lad with Sir Michael Stoute, was named as Employee of the Year at the sixth annual Godolphin Stud and Stable Staff Awards. Messenger, who has been in the industry for more than 32 years, was presented with The Godolphin Trophy by former Classic-winning Jockey, John Reid, after Manchester United and England star, Michael Owen, was unable to attend due to a hamstring injury sustained in Sunday’s Carling Cup Final. Victorious in The Derby, St Leger and Prix de l’Arc de Triomphe to name but a few, Reid is no stranger to the hard work and dedication that goes on behind the scenes of the racing industry and he himself has been made an MBE for his services to the sport. Stuart was described as ‘irreplaceable’ by Sir Michael and someone that he ‘would not want to do the job without’. Starting off with the top trainer when he was still at school he has, over the years, built up an impressive knowledge of racing and to this day, strives to expand this knowledge further. Having learned from some of the best in the industry, Stuart is now a well-respected and trusted teacher and a role model to generations below him.